The University of Utah Physician Assistant Program is hosting a community open house on the Dixie State University campus to offer southern Utah residents more information about the master’s program the two institutions are partnering to offer in St. George. 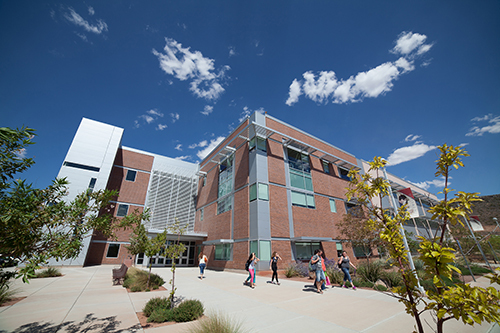 The open house is scheduled to take place from 5:30 to 7:30 p.m. on Thursday, Oct. 6, in Dixie State’s Russell C. Taylor Health Science Center, located on the Dixie Regional Medical Center campus at 1526 Medical Center Drive. Karen Mulitalo, director of the University of Utah's PA program, will be available to offer information and answer questions. The St. George program will be accredited as a satellite of the U of U’s PA Program and operate collaboratively with Dixie State. The U of U anticipates matriculating a class of 16 students in May of 2018, pending final approval by Accreditation Review Commission on Education for the Physician Assistant. Candidates may apply to the Dixie campus in the next application cycle, which opens in April 2017. Requirements for students in the PA program on the Dixie campus will be the same as those for the Salt Lake City campus. “This is an exciting opportunity for our graduates and our region,” Dr. Erin O'Brien, chair of Dixie State’s Department of Biological Sciences, said. “There is a need for PAs in St. George and this allows our students to train and ultimately work here." The Physician Assistant Program prepares students to examine patients, diagnose injuries and illnesses, and provide treatment collaboratively with their supervising physician. The universities are working with Dixie Regional Medical Center and other regional providers to allow students to work with physicians in the community during their second year of the program for their clinical preceptorships. For more information about the Physician Assistant Program and the community open house, visit medicine.utah.edu/dfpm/physician-assistant-studies/program.